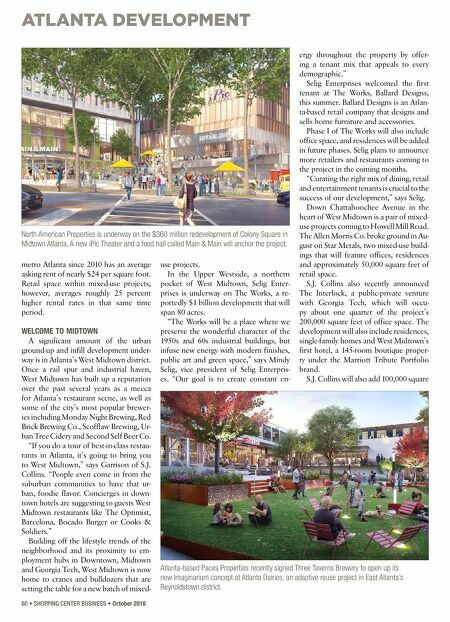 ATLANTA DEVELOPMENT 60 • SHOPPING CENTER BUSINESS • October 2018 metro Atlanta since 2010 has an average asking rent of nearly $24 per square foot. Retail space within mixed-use projects, however, averages roughly 25 percent higher rental rates in that same time period. WELCOME TO MIDTOWN A significant amount of the urban ground-up and infill development under- way is in Atlanta's West Midtown district. Once a rail spur and industrial haven, West Midtown has built up a reputation over the past several years as a mecca for Atlanta's restaurant scene, as well as some of the city's most popular brewer- ies including Monday Night Brewing, Red Brick Brewing Co., Scofflaw Brewing, Ur- ban Tree Cidery and Second Self Beer Co. "If you do a tour of best-in-class restau- rants in Atlanta, it's going to bring you to West Midtown," says Garrison of S.J. Collins. "People even come in from the suburban communities to have that ur- ban, foodie flavor. Concierges in down- town hotels are suggesting to guests West Midtown restaurants like The Optimist, Barcelona, Bocado Burger or Cooks & Soldiers." Building off the lifestyle trends of the neighborhood and its proximity to em- ployment hubs in Downtown, Midtown and Georgia Tech, West Midtown is now home to cranes and bulldozers that are setting the table for a new batch of mixed- use projects. In the Upper Westside, a northern pocket of West Midtown, Selig Enter- prises is underway on The Works, a re- portedly $1 billion development that will span 80 acres. "The Works will be a place where we preserve the wonderful character of the 1950s and 60s industrial buildings, but infuse new energy with modern finishes, public art and green space," says Mindy Selig, vice president of Selig Enterpris- es. "Our goal is to create constant en- ergy throughout the property by offer- ing a tenant mix that appeals to every demographic." Selig Enterprises welcomed the first tenant at The Works, Ballard Designs, this summer. Ballard Designs is an Atlan- ta-based retail company that designs and sells home furniture and accessories. Phase I of The Works will also include office space, and residences will be added in future phases. Selig plans to announce more retailers and restaurants coming to the project in the coming months. 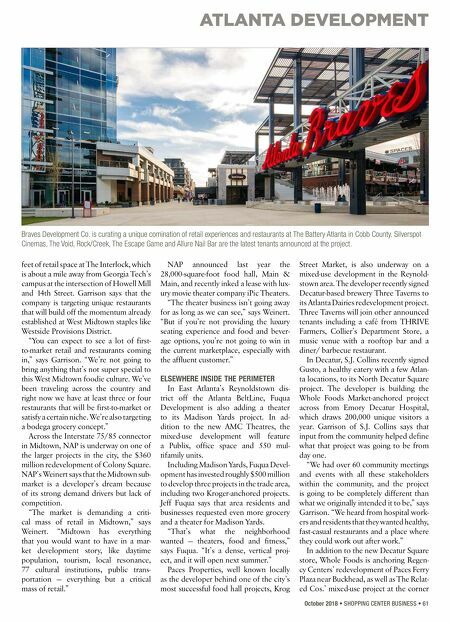 "Curating the right mix of dining, retail and entertainment tenants is crucial to the success of our development," says Selig. Down Chattahoochee Avenue in the heart of West Midtown is a pair of mixed- use projects coming to Howell Mill Road. The Allen Morris Co. broke ground in Au- gust on Star Metals, two mixed-use build- ings that will feature offices, residences and approximately 50,000 square feet of retail space. S.J. Collins also recently announced The Interlock, a public-private venture with Georgia Tech, which will occu- py about one quarter of the project's 200,000 square feet of office space. The development will also include residences, single-family homes and West Midtown's first hotel, a 145-room boutique proper- ty under the Marriott Tribute Portfolio brand. S.J. Collins will also add 100,000 square North American Properties is underway on the $360 million redevelopment of Colony Square in Midtown Atlanta. A new iPic Theater and a food hall called Main & Main will anchor the project. Atlanta-based Paces Properties recently signed Three Taverns Brewery to open up its new Imaginarium concept at Atlanta Dairies, an adaptive reuse project in East Atlanta's Reynoldstown district.